I've decided that I feel a bit like a pioneer woman lately. My youngest has had some stomach issues lately, in particular when we were back in the States eating lots of fast food and bread. Both my mother-in-law and sister-in-law have celiac disease, so, after experiencing some of the same issues myself, we decided to look at going gluten free. In fact my eleven year old decided on his own that this was what he wanted to do, and sure enough his stomach aches went away. One of the positive things about living in Africa is that we eat a lot of fresh fruits and vegetables, and make most things from scratch. That means, of course, less processed foods and preservatives. But while we're used to not eating a lot of bread products, we still love pancakes and grilled cheese every now and then. The only problem was that gluten-free products are still limited in South Africa and often expensive. Thankfully, I have found some great gluten free, all-purpose flours to experiment with that aren't too expensive along with rice flour and some other basic ingredients. My first attempt at homemade bread tasted good...at least the part that wasn't a gooey mess. My second attempt today, with a different recipe, turned out much better. You can find the recipe here. I used my own flour mixture of gluten-free self rising flour, gluten-free high-fiber bread flour, and flax seed flour (ground with our coffee grinder), and will definitely make this again. The banana bread was also a huge hit. The first loaf was gone in a matter of minutes and honestly, I don't think you could tell it was gluten-free. Because I can't get some of the basic flours, I again substituted my own mix. If you live in South Africa, you might have already discovered these gluten-free products. They are pretty easy to find and are priced reasonably. My kids weren't fond of some of the ready made mixes, but using these, I can make pancakes, for example from scratch with my normal recipe and they love them. What about you? Do you have any favorite gluten-free recipes your family loves? I'd love to hear about them. The ECHO Project Update: Make a difference today! Maybe it's just me, but I'm finding it hard to believe that the year is almost half over! A lot has happened over the past few months, so here is an update on some of the exciting things that God is doing through The ECHO Project. We started this non-profit to help support the many needs that we see every day here in Africa, and God has been so faithful to help us to more than we honestly ever asked or imagined! So many people have been involved in helping us financially, including Sunday School classes, individuals, church coffee shops, and even several kids who have raised money for us by selling Alex's jewelry to their friends. We are so grateful for everyone who has gotten involved and helped us to make a difference! Thank you! For more ideas how to get involved and make a difference, click here. The last few months have been exceptionally hectic for our family. Between homeschooling, ministry, building a house, short-term mission groups, writing, and life in general, I sometimes find myself feeling that all I do is run from early morning to late at night. It doesn’t really matter what your job is or what you are going through at the moment, we all understand and experience stress on a daily basis, both good and bad. A couple weeks ago I wrote this post for my International Christian Fiction blog, and thought I'd shared it with you this week. As I grow older, I've noticed that it is essential to find both quiet and balance in all the chaos. Especially when my 'jobs' are never ending. For example, as a writer, between writing, brainstorming, editing, and marketing, and social networking my job is never finished. And that is just one segment of my life! Seth Godin has a great blog post on Dancing on the Edge of Finished that really got me thinking about how while it might be true that there is always one more things to do, my life should be "a dance, not an endless grind." It started me thinking about the importance of finding that balance in my life. So here are nine things I'm trying to implement to help kiss stress good-bye! Learn To Say No: Michael Hyatt recently had a blog post dealing with the importance of saying no. We can only do so many things in a day, and as hard as it might be, sometimes we have to say no. Delegate: Are your kids old enough to take on extra responsibilities around the house? Can you call on a friend to help you out on a project? It’s easy to want to keep that control and do it all ourselves, but there is also a blessing in having others pitch in and help. Exercise: I always see a difference in the way I feel when I stick to my exercise routine. I feel better, I’m healthier, and more relaxed. Exercise can improve so many aspects of our lives both mentally and physically by improving our mood, combatting disease, and boosting our energy. Positive Self-talk: I’ve been amazed at how many time the Bible talks about the importance of our thoughts. Paul says in Philippians 4:8 that we should be thinking about things that are true, pure, and lovely. He also says in 2 Corinthians 19:5 to take captive every captive and make it obedient to Christ. Keep in Tune with the Spirit: In connection with positive self-talk, it is important to look at what are we filling our minds with? If we are filling our minds with constant negativity from the media and television, it’s hard to be in tune with the Holy Spirit and his active roll in our lives. Remember You’re not Superwoman or Superman: (And you don't have to be.) It’s so easy to compare ourselves with others, and believe that we have to do it all ourselves. We look at others around us and feel as if we fall short when we can't keep up. Putting reasonable expectations on ourselves is essential to cutting out stress. 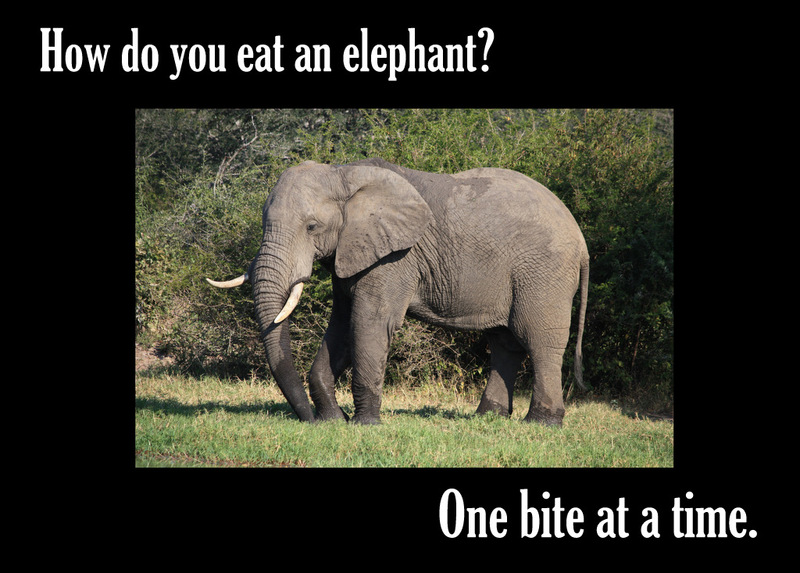 Prioritize: Have you ever heard the old expression, "How do you eat an elephant? 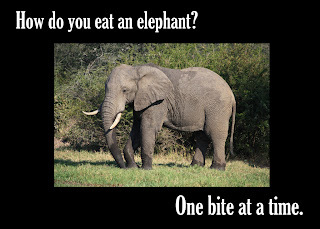 One bite at a time." It means that when you are facing an overwhelming situation that feels too big to handle, you need to take a deep breath and don't panic. My own kids, for example, start to panic when they find out they have to write a research paper, until I tell them not to focus on the overall goal, but instead the mini-steps they will take to get there. Break things down into small pieces. One thing at a time. One day at a time. It really does make a difference. Laugh more: I have some good friends who send me links to funny You Tube videos because they know how important laughter is. The saying is true that laughter is the best medicine! 1 What about you? I’d love to hear your ideas of what helps you handle stress. For those of you who didn't see the recent photos I posted on FB, here are some of my favorites from our recent trip to Kruger with the team from Katy, Texas. We enjoyed a day in the park on our way to drop them off for their trip home. God continues to do incredible things, opening doors and moving hearts through the team from Katy and their help in the work here. Here are two more videos from the weekend. Enjoy! For those of you following our ministry, here are three short highlight videos from this week. Today I went out to see the well with the Katy Team after picking them up from the airport. What we found there moved me to tears. When Scott called me this morning from the village, the drillers had arrived, and I could hear people singing in the background. They are so excited and this will be such a blessing for them. The drillers hit water today, so it won't belong until they have their own source of water! I'll be sharing more about the water project along with some of the other things that are happening with our short term teams in the coming days and weeks.